In the stretch of coast between Chiavari and La Spezia is located a natural paradise in which a sharp orographic verticality with an intense blue sea, whose coast is dotted by enchanting multicolored fishing villages. 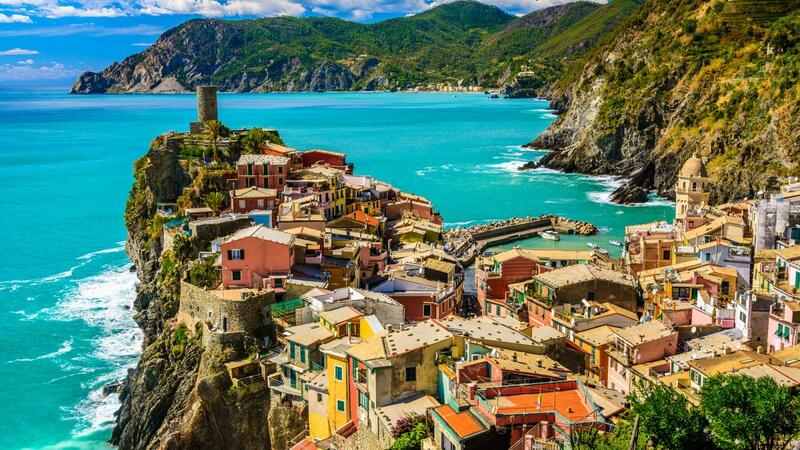 We are located in a UNESCO World Heritage Site (1997): welcome to the Cinque Terre National Park. This small natural enclave (4,300 ha) of an ancient fishing and agricultural tradition (vineyards, olive trees) and strategic passage in the confluence of towns and cultures, is articulated around five villas that form a beautiful labyrinth of slopes, escarpments, cliffs, stairs And terraces that overlook us in precarious balance to the bays and coves of the beautiful sea of Liguria. The access to the park is made from Porto Venere, which with its splendid architectural set of s. XII, divided into a beautiful network of genuine and disparate houses of colors, is in itself a delicious and stimulating destination for the most dreamy and romantic. Already in our destination we will find the suggestive site that offers us a rich color palette encased in the vertiginous orography of this part of the coast liguria, with the picturesque localities of Riomaggiore, anchored in time with its castle – with splendid sea views – in the middle of colorful and steep streets; Manarola, risen on its steep promontory as a balcony to the sea, being considered the oldest, authentic and genuine jewel of the region; Corniglia, the smallest, perched in fragile equilibrium to a rock of 100 meters high, where we will get up the 377 steps of the picturesque road of La Lardarina, although it is also possible to arrive by bus; Vernazza, As the archetypal natural port of multicolored publications and documentaries, with delicious postcard prints in the form of traditional architecture set in cliffs adjoining the fertile Mediterranean hills, and Monterrosso al Mare, the most populated, located in a natural gulf with its warm stretches of sand for lovers of the enjoyment of the beach / sea binomial amidst an incomparable setting. The best times to enjoy them in all their splendor are spring and autumn, being discouraged the summer by the massive influx of visitors, the humidity of the area and the closing of certain steps.